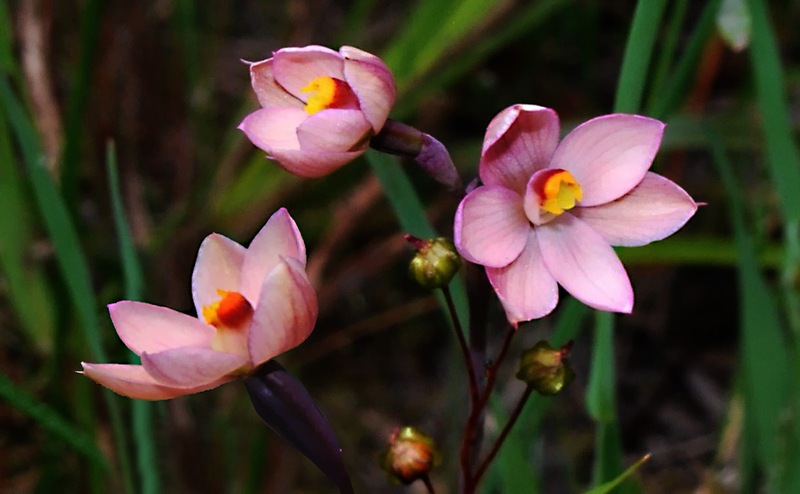 Thelymitra carnea, the pink sun orchid, is a perennial herb with fleshy egg-shaped tubers in the Orchidaceae family. It grows from 8 to 40 cm and has a slender reddish-brown stem. Plants are scattered. It has an erect single narrow to rounded channelled leaf 4-18cm x 1-2.5mm, green with reddish base, sheathing at base of stem; 2-3 sheathing stem bracts. Each plant has one to four pink flowers up to 15mm across. Sepals and petals are similar. Column pale pink, mid lobe with pink collar and yellow tip, short, narrow, not hooded; yellow column arms narrow, obliquely erect, margins scalloped; anther green. It flowers October to November. The plant grows in moist soils which dry out in summer on margins of swamps. It prefers full sun to semi shade. Flowers only open on hot humid days, self-pollinating in cooler weather. It is found in Southeastern Australia and New Zealand. It is not threatened in the wild. The use of native orchids in gardens is not recommended, unless they already occur naturally, in which case they need to be protected. Removing orchids from the bush usually results in their death and further depletes remaining wild orchid populations. Take only photographs, not plants from the bush! 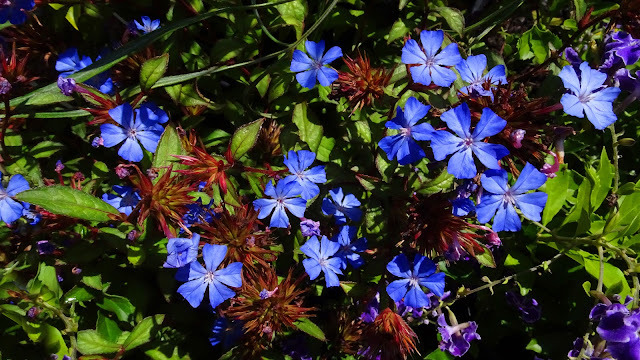 Ceratostigma, or leadwort, plumbago, is a genus of eight species of flowering plants in the family Plumbaginaceae, native to warm temperate to tropical regions of Africa and Asia. Common names are shared with the genus Plumbago. They are flowering herbaceous plants, subshrubs, or small shrubs growing to 0.3–1 m tall. The leaves are spirally arranged, simple, 1–9 cm long, usually with a hairy margin. Some of the species are evergreen, others deciduous. The flowers are produced in a compact inflorescence, each flower with a five-lobed corolla; flower colour varies from pale to dark blue to red-purple. The fruit is a small bristly capsule containing a single seed. Ceratostigma willmottianum shown here is a species of flowering plant native to western China and Tibet. It is an ornamental deciduous shrub that grows to 1 metre in height, with pale blue plumbago-like flowers appearing in autumn as the leaves start to turn red. Ceratostigma is derived from Greek, meaning 'horned stigma’. This is in reference to the ‘shape of the stigmatic surface’. Willmottianum was named for Miss Ellen Ann Willmott (1858-1934), a keen gardener and plant introducer from Warley Place, Essex. Stephanotis floribunda syn. S. jasminoides (Madagascar jasmine, waxflower, Hawaiian wedding flower, bridal wreath) is a species of flowering plant in the family Apocynaceae, native to Madagascar. Growing to 6 m or more, it is an evergreen woody climber with glossy, leathery oval leaves and clusters of pure white, waxy, intensely fragrant tubular flowers. Grown commercially, the trumpet-shaped blooms are in season year-round, provided they are given enough light and water, and are a popular component of bridal bouquets. It is a vigorous climber, tough-stemmed, bearing dark green leathery leaves, which grow in pairs at regular intervals along the vine. It grows best in sunny, tropical conditions, or inside. They can grow from 2–6 meters, and are widely cultivated as garden plants. They can flourish for years, grown indoors on a sunny windowsill. They can be moved outside or into a greenhouse during the summer. Few resources are published relating to the culture of this woody vine. 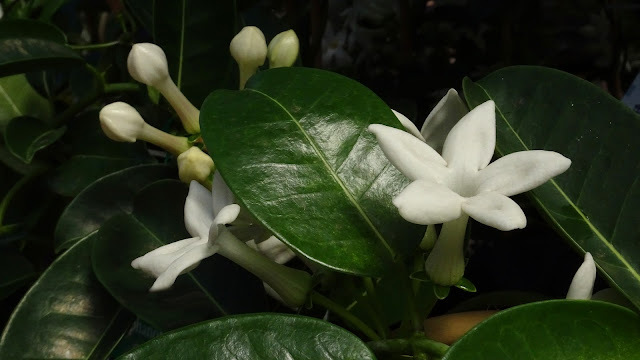 In areas where the outside winter temperature drops below 4 °C, Stephanotis floribunda can be wintered over in greenhouse or household settings. During the summer growth season, this vine requires full sun, abundant water, high humidity and a balanced fertiliser. The vine will need to be trellised due to the vigorous growth habit. As temperatures begin to cool, pots should be brought indoors and placed in the sunniest location available. If the temperature in the home is on the cool side, the vines slow in their growth and thus should be watered very infrequently. Kept on the cool, sunny and dry side, the plants will "rest" until the outside temperatures begin to rise again, at which time they may be eased back into full sun. They may continue to grow during this period, but growth is often slower and less vigorous. When the weather warms, moving the vines into a full sun exposure too quickly will result in leaf blister and sun burns on the plant, rendering it less attractive and damaging the plant's ability to produce food. In ideal conditions, these vines may be kept in bloom all year, but this is difficult in the home setting, especially where Australian possums, to which the leaves are highly attractive, are present. This plant has gained the Royal Horticultural Society's Award of Garden Merit. Stephanotis floribunda appears to do best if root bound, thus it is best to not plant the vines in an over-sized container. The soil mixture used should have a high content of loam and peat moss with generous drainage material such as perlite or coarse sand. A citrus-type soil mixture works well in most home situations. A soil mixture that retains too much water will lead to root rot. 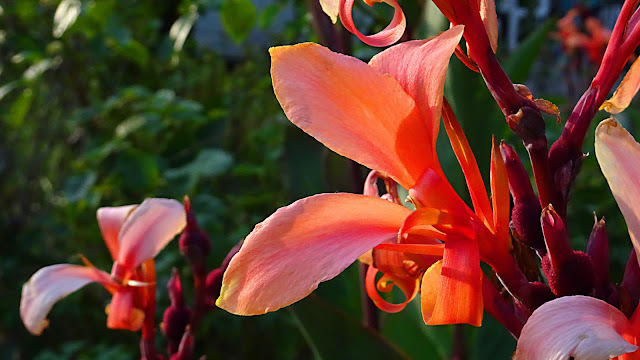 Canna (or canna lily, although not a true lily) is a genus of 19 species of flowering plants. The closest living relations to cannas are the other plant families of the order Zingiberales, that is the Zingiberaceae (gingers), Musaceae (bananas), Marantaceae, Heliconiaceae, Strelitziaceae. Canna is the only genus in the family Cannaceae. The APG II system of 2003 also recognises the family, and assigns it to the order Zingiberales in the clade commelinids, in the monocots. The genus is native to tropical and subtropical regions of the New World, from the southern United States (southern South Carolina west to southern Texas) and south to northern Argentina. The species have large, attractive foliage, and horticulturists have turned it into a large-flowered and bright garden plant. In addition, it is one of the world's richest starch sources, and is an agricultural plant. Although a plant of the tropics, most cultivars have been developed in temperate climates and are easy to grow in most countries of the world as long as they receive at least 6–8 hours average sunlight during the summer, and are moved to a warm location for the winter. The name Canna originates from the Latin word for a cane or reed. The flowers are typically red, orange, or yellow or any combination of those colours, and are aggregated in inflorescences that are spikes or panicles (thyrses). Although gardeners enjoy these odd flowers, nature really intended them to attract pollinators collecting nectar and pollen, such as bees, hummingbirds, sunbirds, and bats. The pollination mechanism is conspicuously specialised.